First impressions count. You don’t get a second chance to make that first impression. Trust us on this. 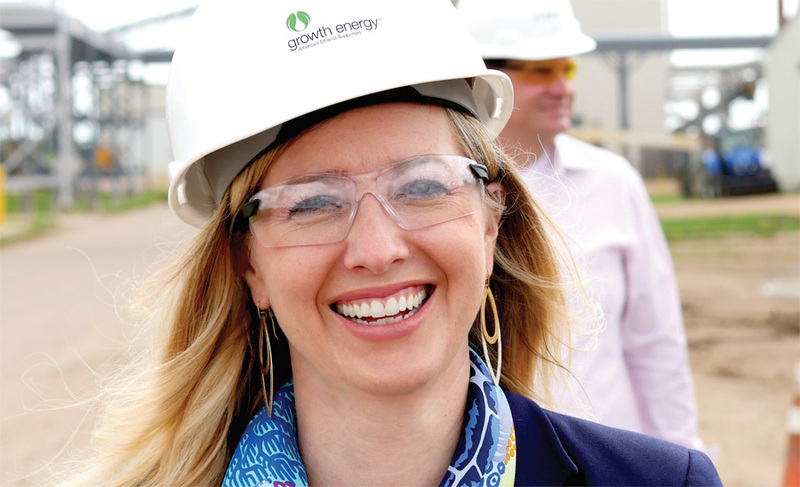 So it’s a good thing that Emily Skor, Growth Energy’s new Chief Executive Officer, comes off as a person you’d really want to hang out with. Someone you’d want to take time out of your day for – drink coffee and converse, swap a few stories about things inconsequential or debate the serious issues of the day. Because Skor is quick with a story. And she’s self-effacing, gracious, attentive and passionate – all at the same time. “Vital wants to do a profile on me?” the 41-year-old sincerely asked. “Oh, my gosh, I’m going to have to make myself interesting.” These are qualities that have not been lost on Growth Energy’s Board of Directors – and its outgoing CEO Tom Buis. Skor’s journey to Growth Energy’s CEO has been non-traditional, to say the least. Before joining Growth Energy on May 16, she served as the Vice President for Communications of the Consumer Healthcare Products Association (CHPA) and the Executive Director of the CHPA Educational Foundation. At CHPA, a member-based trade association advocating for consumer healthcare products and serving as leader on regulatory and scientific issues for the industry, Skor oversaw public affairs campaigns, integrating strategic communications into legislative campaigns and coordinating ally development. Before joining CHPA, Skor served as Senior Vice President at Dezenhall Resources, a nationally recognized crisis communications and issues management firm. For more than a decade, she helped Fortune 500 companies and industry associations manage issues affecting brand confidence and corporate reputation through media, advocacy, coalition building and consumer education campaigns. “I think I happened to come onboard during a - dare I say - a particularly dynamic time of the industry,” Skor said from her Growth Energy office in Washington, D.C. “My third day on the job was the day that the EPA issued its proposed rules on the (Renewable Fuels Standard). And the fact that I’m coming onboard in the year where you have a Presidential election, well, that’s quite a dynamic there. A Minnesota native, Skor grew up in a home that stressed that she – and her three sisters – could be anything they wanted to be. Skor played tennis – she competed in college at the Division III level – and also played classical piano. She entered Wellesley College, an all-woman’s liberal-arts college near Boston, on a political science tract. But found her calling in communications after working as an intern for the Washington, D.C.-based think-tank The Center for Defense Information. It’s where she fell in love with the art of the message by helping co-produce a 30-minute television segment for the Public Broadcasting Service. The topic? Chemical and biological warfare. It’s another point that is not lost on Growth Energy’s board. In short, Skor is tasked with bringing the message of ethanol directly to the consumer – whether it be a millennial in San Francisco, a mom in Sioux Falls, SD, or a taxi driver in New York City. “We’re very good at tailoring our message to politicians,” she said. “We need to do the same thing with consumers. And that’s the real pivot for Growth Energy and for all of our partners – it’s to build consumer narrative that talks to consumers in their terms. Before I came onboard, Growth Energy did some research on this and very much validates this. To that end, Growth Energy debuted a new consumer website (GetEthanol.com) in September, and will aggressively engage people across a variety of social media platforms, including Twitter, Facebook, Instagram and Snapchat. When not bringing Growth Energy’s message of clean, renewable energy to the masses, Skor keeps busy with family and volunteers on various boards. She’s married to Sean Cairncross, the Republican National Committee’s Chief Operating Officer. The couple have two children, daughter India, 8, and Dominic, 6. And what do her children think about mom’s new gig in energy and ethanol? Nearing the end of an hour-long interview, the discussion shifts from questions about the Renewable Fuel Standard and how Growth Energy plans to use social media to reach soccer moms and millennials to small talk that signaled an end point. Skor began to laugh. Everyone on the call, including Growth Energy’s Director of Communications Michael Frohlich, is immediately at ease. Part of that lasting impression for anyone who meets Skor. 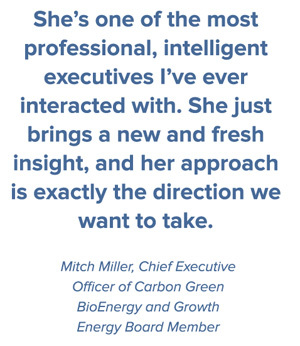 “I am absolutely excited about the future of Growth Energy,” said Carbon Green BioEnergy’s Miller. “Emily is exactly what we needed.